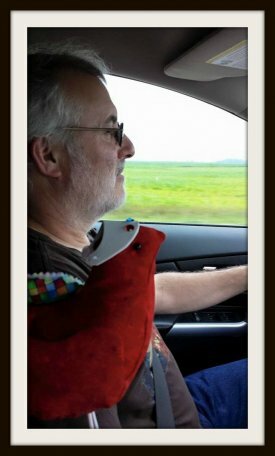 on their Row x Row Travels during 2015! Hi! I'm Ethel and am looking for a ride out EAST. It's been my dream to sunbathe on the beach of the Atlantic Ocean. If you're going East, mind if I tag along? Oh my goodness! 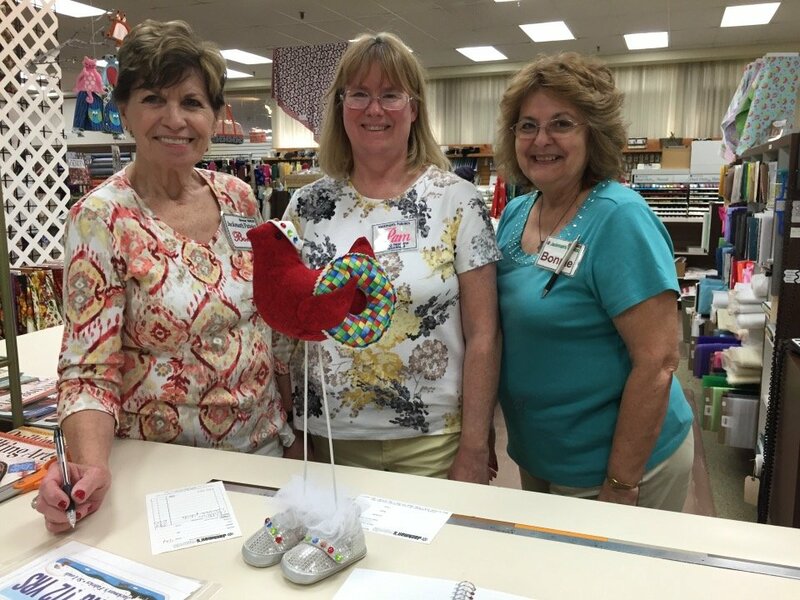 Our last little birdie, Ethel, has found her flock! 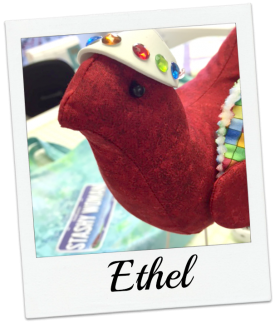 Ethel has a ride! 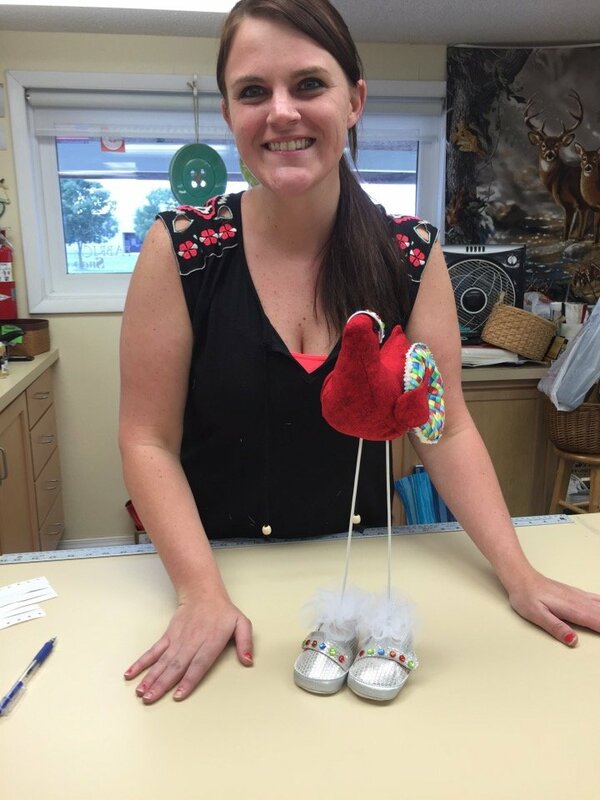 She is going on the big bus with girls from Mimi's Flock! 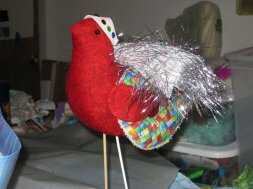 Now all of our Bobbin the Robins have left the SEW BIZ Inc. nest! What is Donelle going to do now? 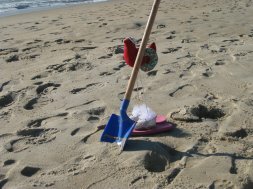 Ethel has been spending time with Karen, both at her home in Westminster, MD, and on vacation in Bethany Beach, DE, between July 28 and August 3.. She first tried to get some reading in while Karen started getting ready for vacation. 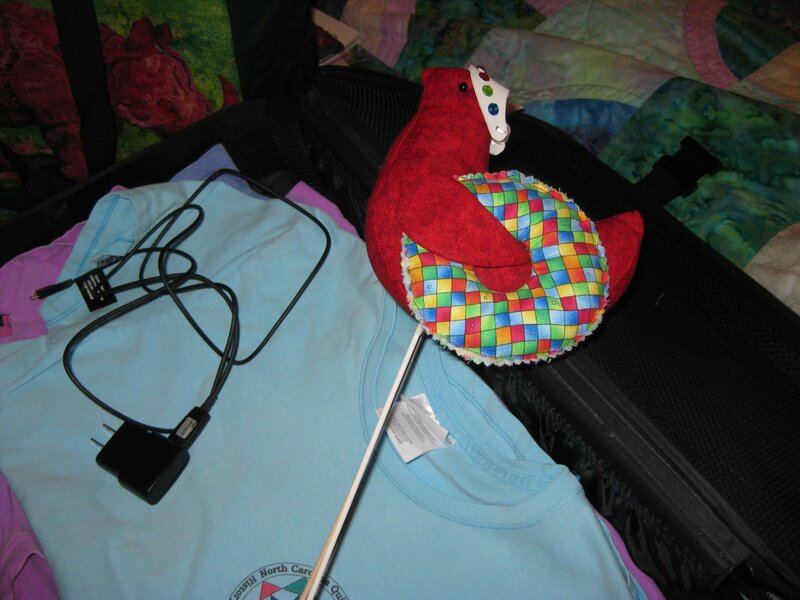 Then Ethel insisted on hanging out in the suitcase. 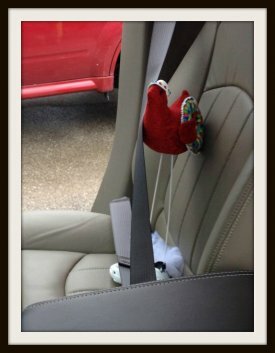 Finally, they got on the road. 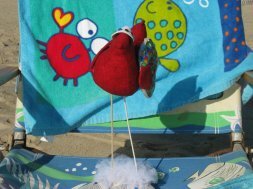 After a long car ride (Ethel said she could have flown there faster), Karen and Ethel arrived at Bethany Beach, DE, for some beach time. 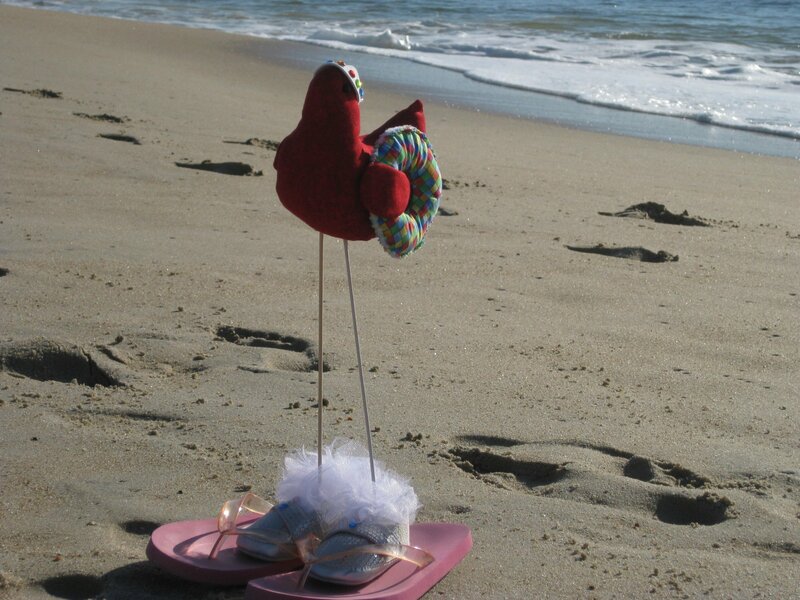 First, Ethel took care sunscreen, then she took over Karen's pink flip flops - she did not want sand on her pretty shoes. 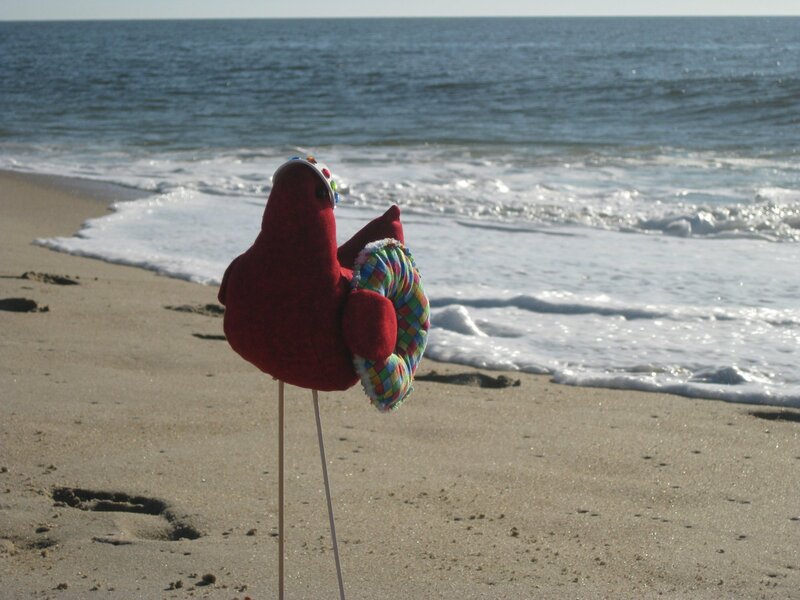 Then, Ethel posed with the ocean as the bathing beauty she really is. She dug in the sand for a bit - not too long, that's hard work and she had a chair to sit in. Hello! My name is Wanda, and I'm the Wild One of the family. I want to visit the WEST - see the Bad Lands, Yellowstone National Park, Grand Canyon, and most of all, the Pacific Coast! Can you help me out by giving me a ride? Big news! 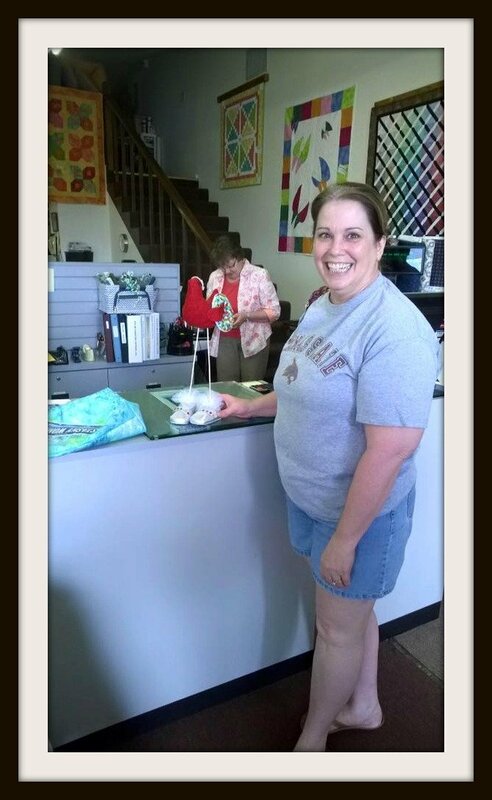 Wanda is leaving the nest today! 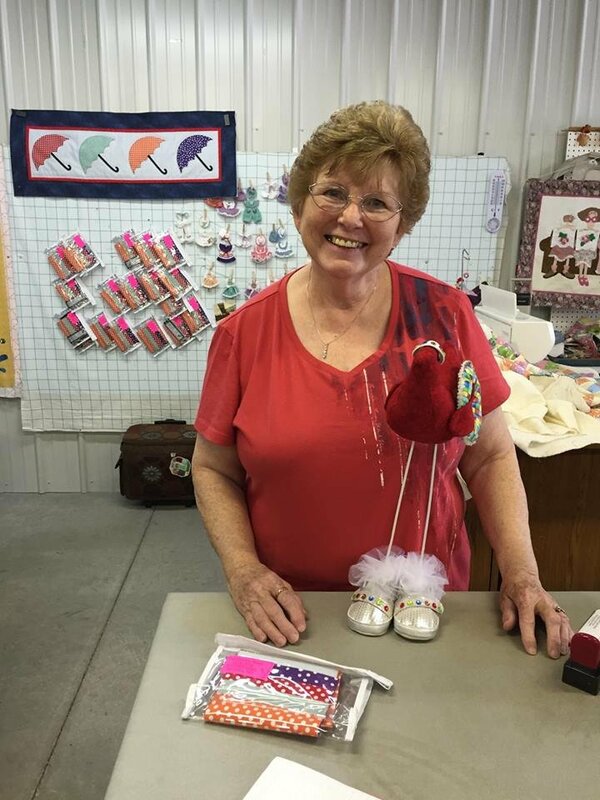 She has found her ride out west with Caron Symon from Grapevine, Texas. 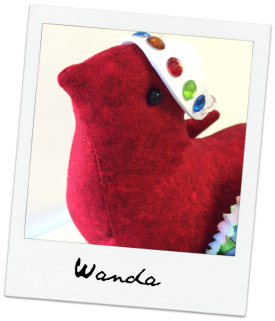 Good luck on your travels Wanda! Write back soon! Today was so exciting. 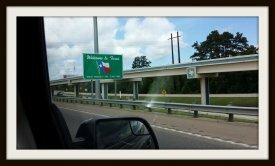 We visited a lot of shops and made it to Texas! First shop Merrily We Quilt Along. Springfield , MO. 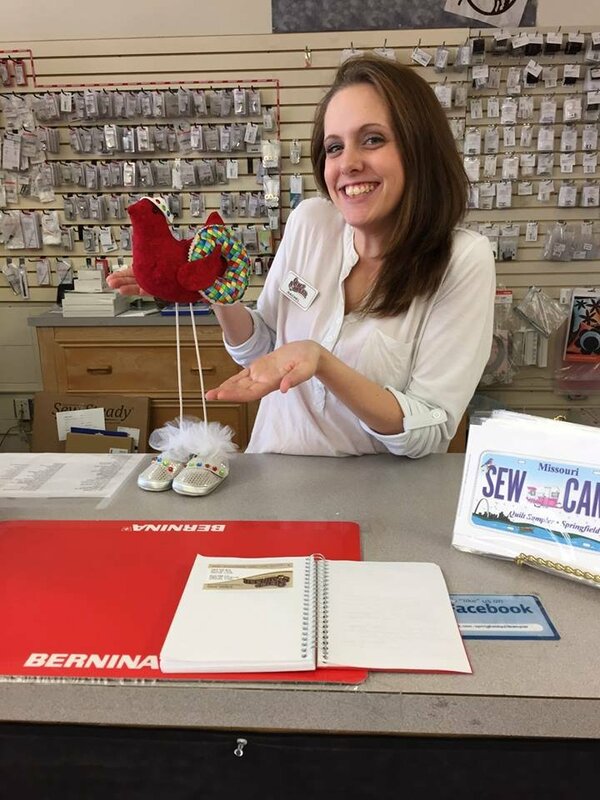 Fun and happy employees just like Sew Biz. 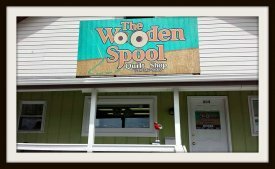 the Wooden Spool in Effingham, Illinois where I met Kristina. 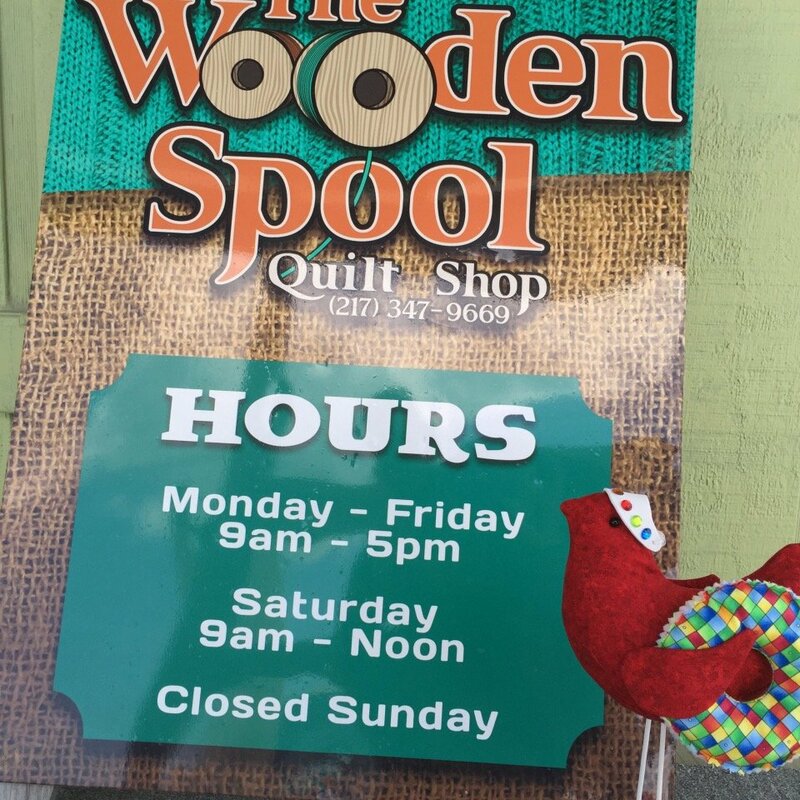 Wanda heard great things about the Wooden Spool from Aunt Nettie who traveled through here earlier. Jackman's fabrics. St. Louis, MO. 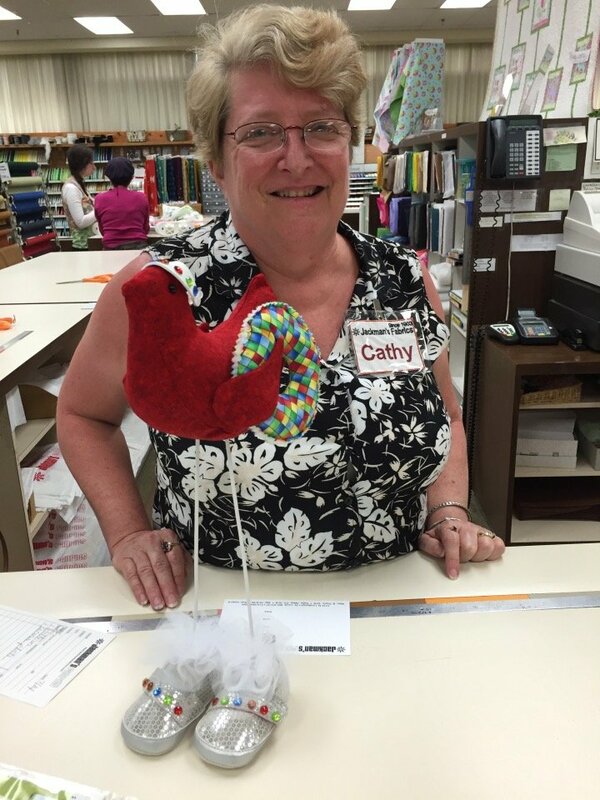 Cathy was so sweet, she has a great smile! Here is the rest of the gang. They are super. They even took pics of me. Oh boy! I've had a busy day! And found the love of my life! I really like his shoes! 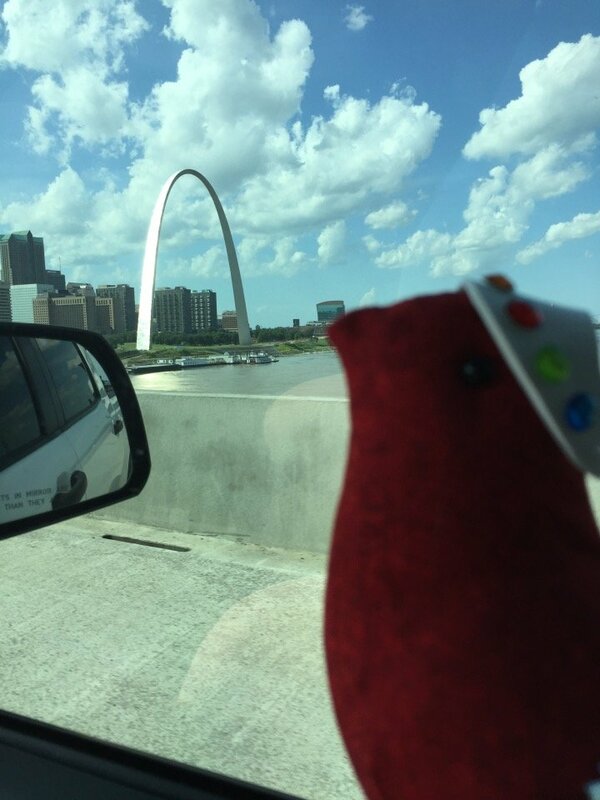 Sometime today I crossed the mighty Mississippi and saw the St. Louis Arch! Joplin , MO. 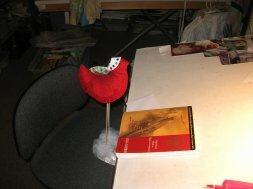 The Fabric Merchant. This is a brand new store that was set to open in August but opened in June just because of Row x Row. 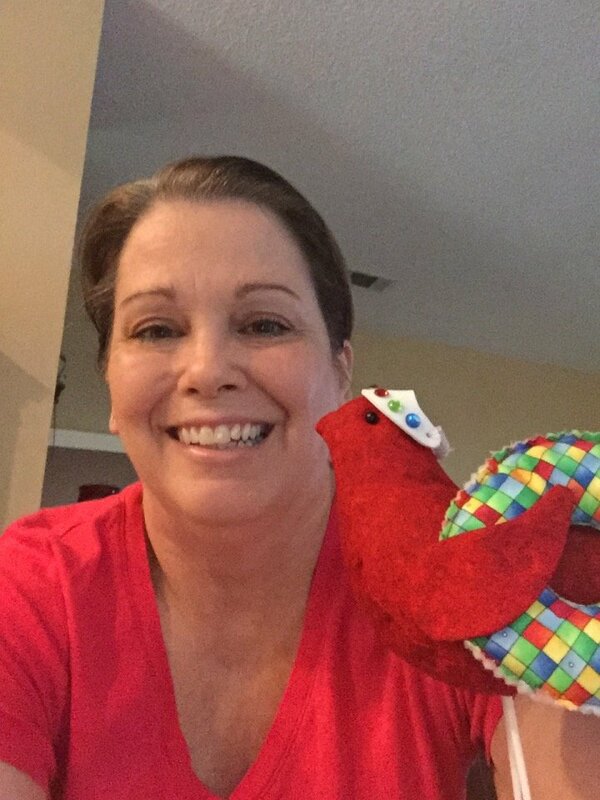 They thought I was the cutest red bird ever. We had to drive north of I -44 to get there and enjoyed the beautiful old downtown of Joplin. Wanda- next we hopped quickly over to Joplin, MO. 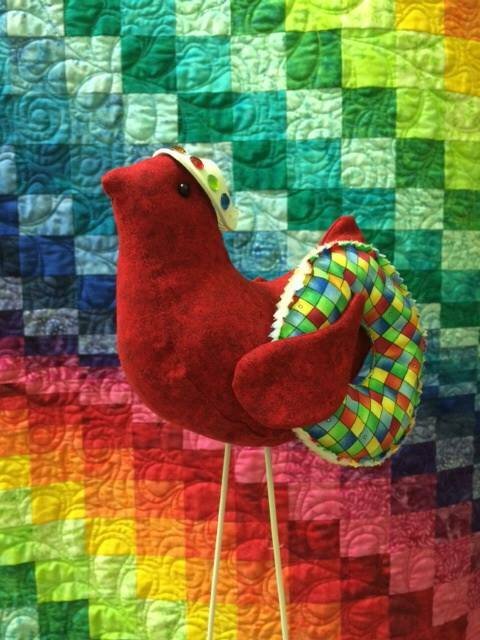 To Bittersweet quilts. We weren't able to do a pic but I wanted to give them a shoutout. It was s beautiful 6 mile drive south of I-44 to get there. Still heading west. Carthage, MO. 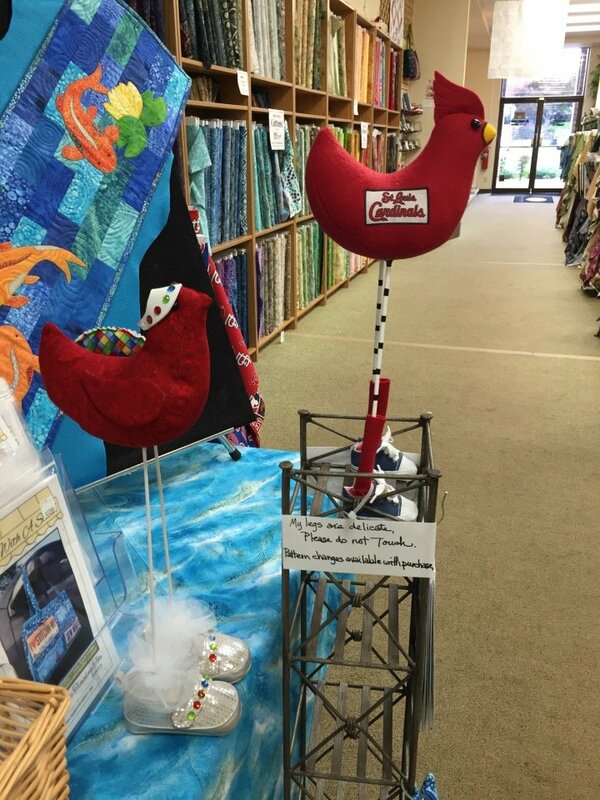 Country Quilt Store has the cutest umbrellas on their row by row. 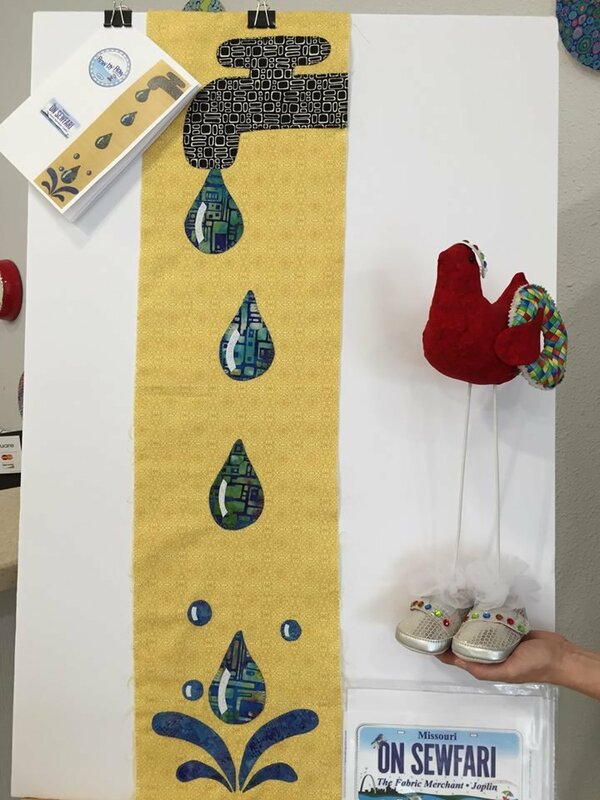 We also got to pick our fabric kit hoping to get a $25 gift certificate hidden inside of it. It was exciting but we didn't win. Today I am resting up in Grapevine, Texas. We drove 520 miles yesterday. Texas is hot! The AC is on and Meg and Buz are napping. 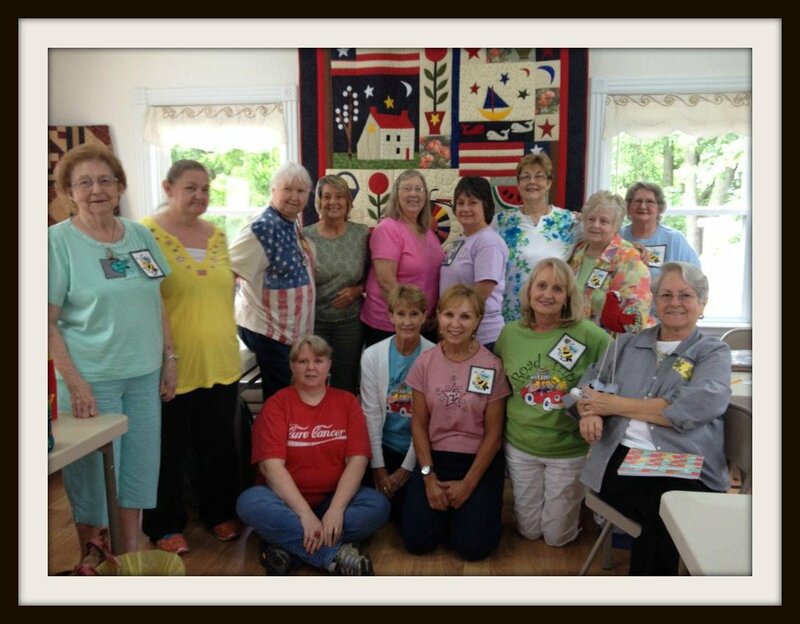 I will be traveling to Lewisville tomorrow to Quilt Country. Hopefully I will find another ride toward the West Coast. 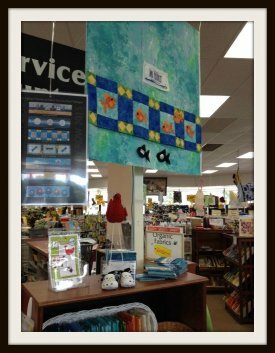 It was SEW nice of the Quilt Country store ladies to make this quilt to go along with Wanda's inner tube. 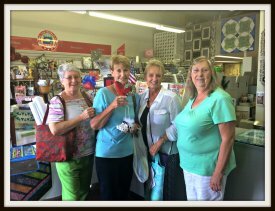 Wanda has been having a great time at the Quilt Country Store in Lewisville, Texas. 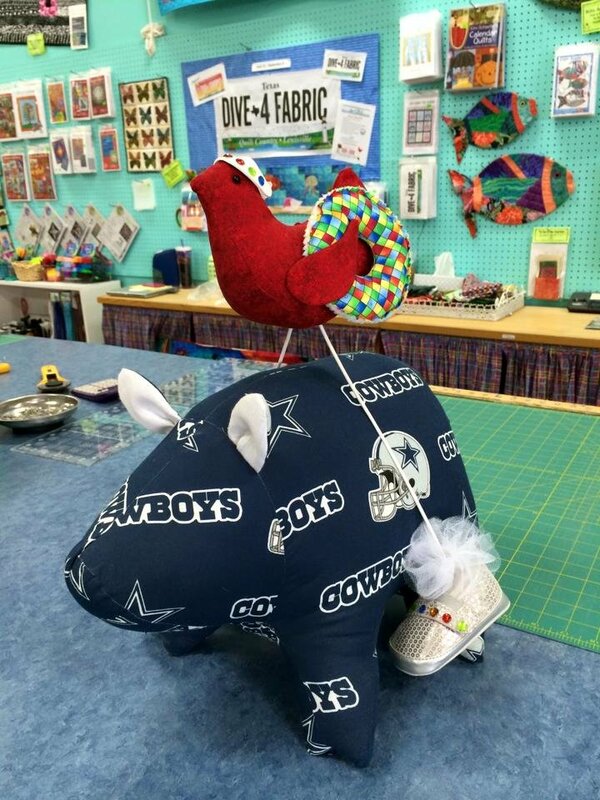 And she "thinks" she has found a new NFL team to root for… Wanda, we need to talk when you get back! 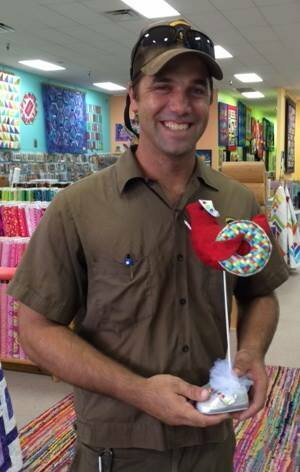 However, one thing we CAN agree on is how much we all love our UPS guys! 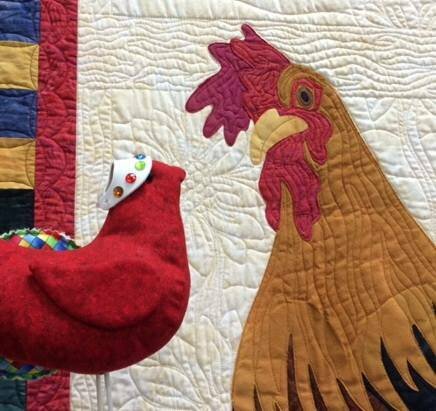 The ladies of Quilt Country had a hard time keeping Wanda in the store. She really wanted to tag along with their UPS guy today. Hi Ya'll! Name's Gertie and I'm looking forward to dipping my toes in the waters of the Gulf of Mexico. 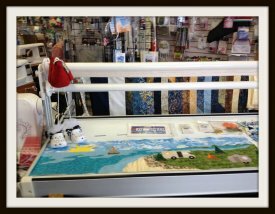 If you are planning on vacationing or visiting Quilting Shops that way, can I go too? 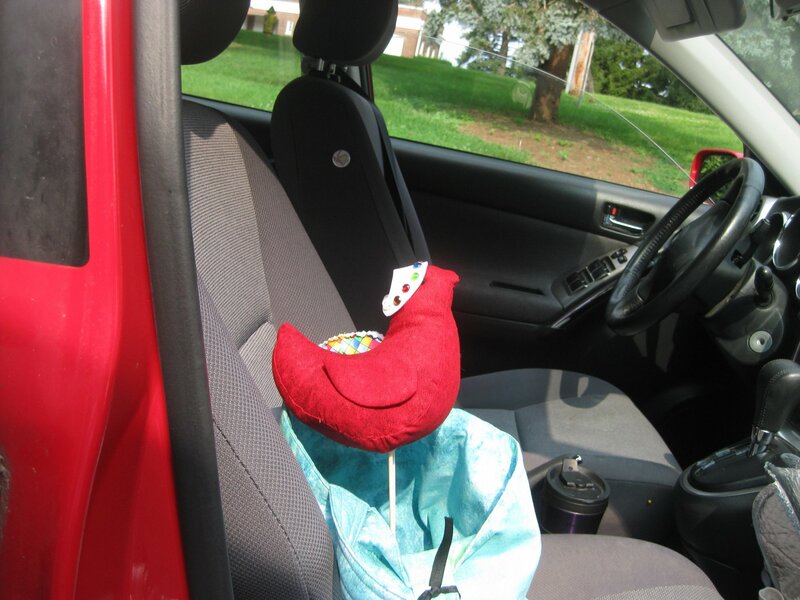 Gertie is off with the Girls from KY! 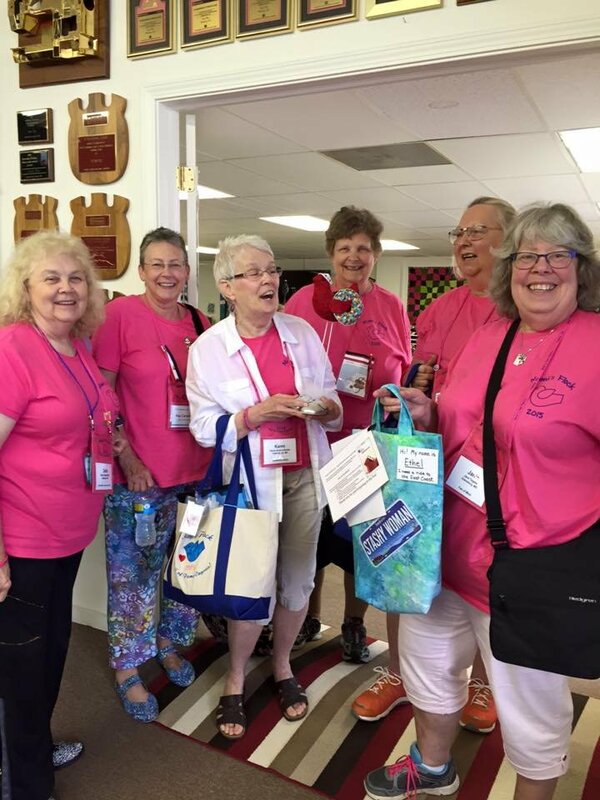 Gertie is having a great time with the Ky girls. First day visited more shops on the Row by Row had a great supper, watch some TV and went to bed. 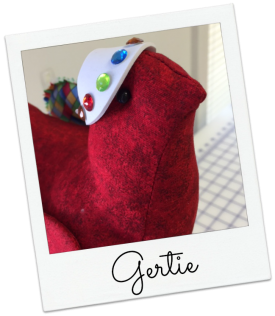 Gertie seems to be missing in action. Does anyone have a report as to her whereabouts? 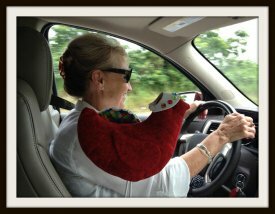 Gertie isn't lost she has been traveling! 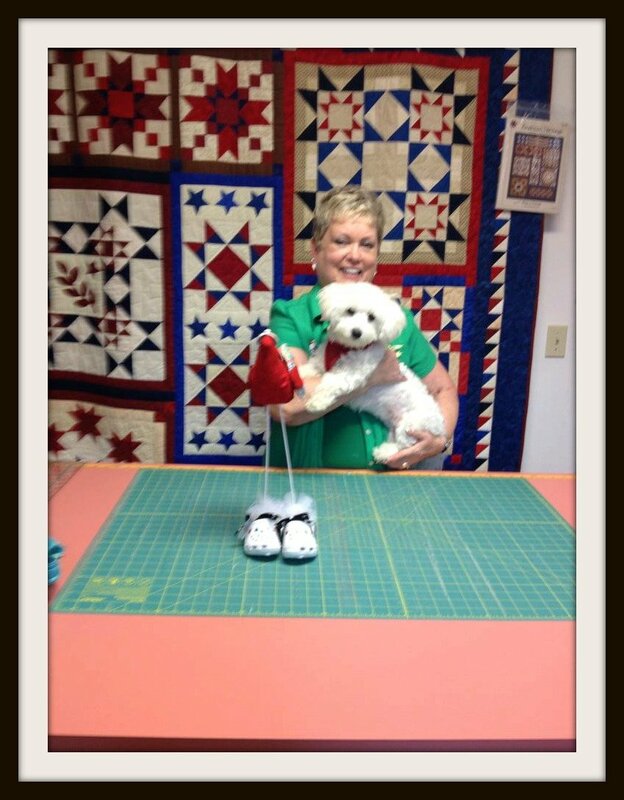 Gertie stopped in Wabash IN at two quilt shops, Nancy J and Heaven on Earth. 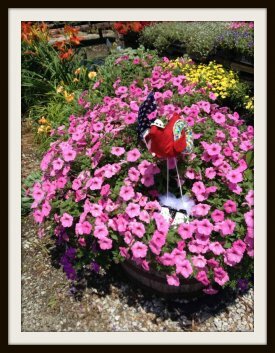 There she rested in the beautiful garden for awhile. Gertie is still going north and she can't figure it out. 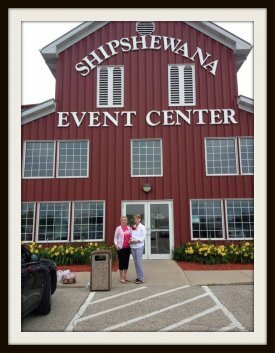 The KY girls wanted to go to the Shipshewana Quilt Fest. Gertie met with a lot of new friends today. 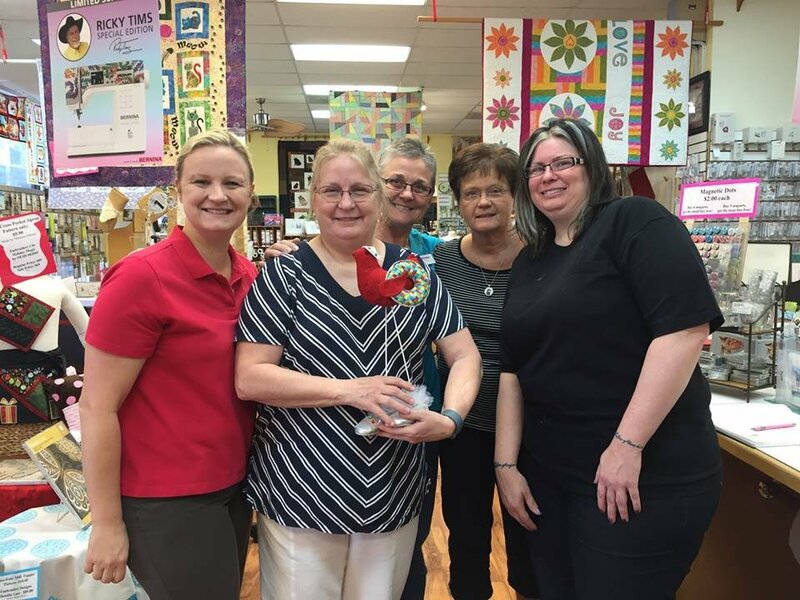 Her first stop was the Punpkinvine Quilt shop. After that she went to The Quilt Shop at the Essenhaus. 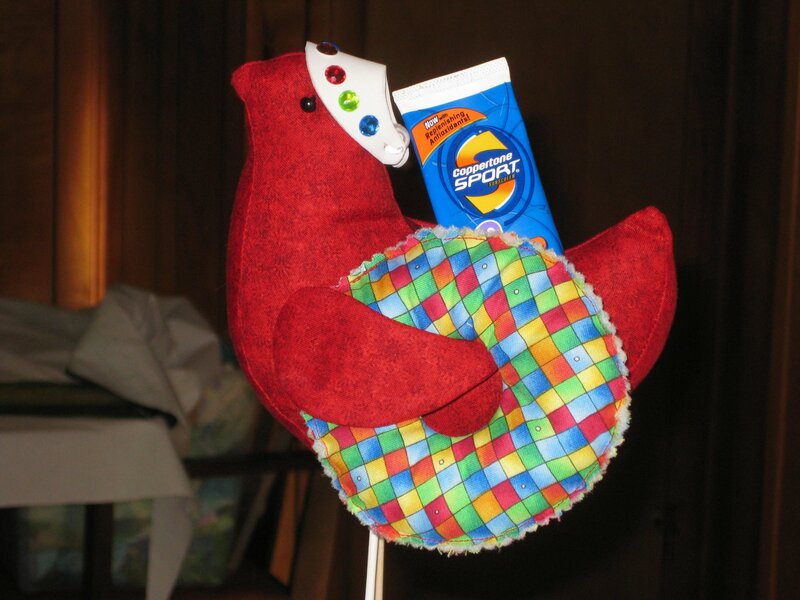 There she met another Bobbin Robbin. 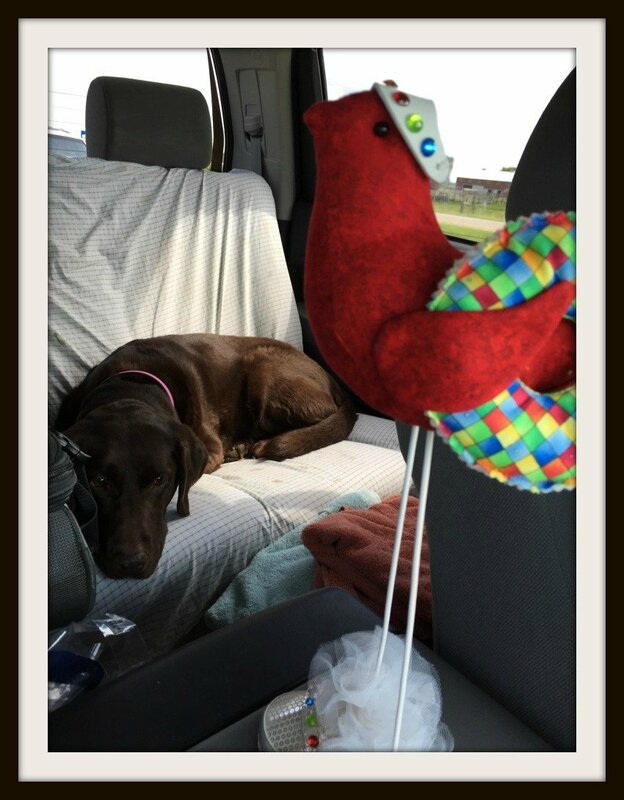 After a good visit she was on the road again. Then, she met Nina Bonnie at the Cotton Corner Shop. 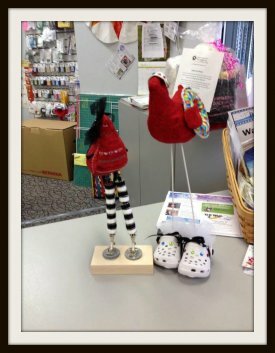 Nina had a real cute story about her black & white stocking and Presser feet. Gertie bid Nina good by and was off again. 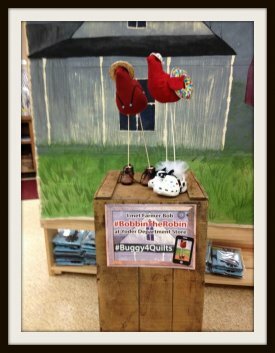 And finally, she met Farmer Bob at Yoder's Department Store spent some time taking a photo shoot! What a busy day! 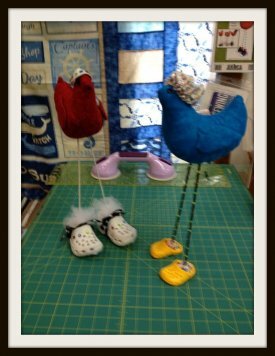 Gertie traveled on with the KY girls Nancy, Belinda, Sharon & Betty. 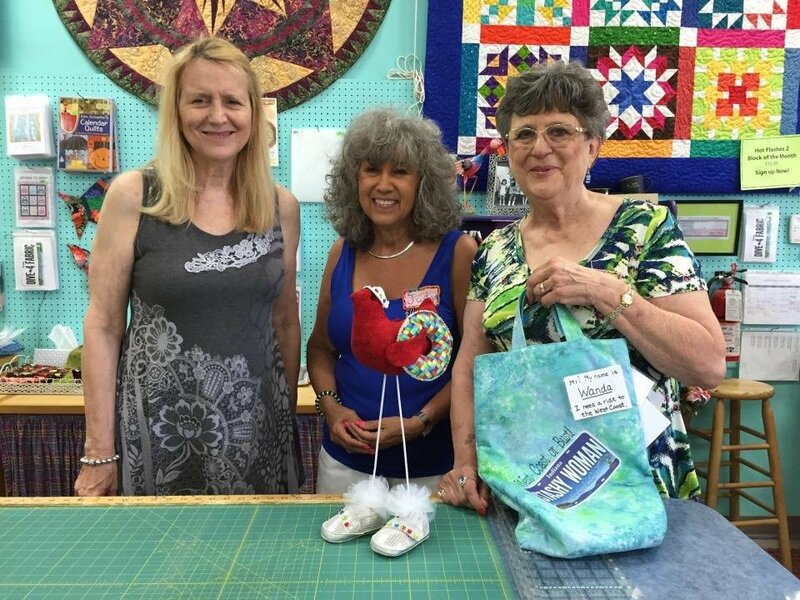 Their next stop was at Sew Creative Threads in Elkhart, IN. There she really liked their Row By Row. We better keep a close eye on her, she said something about an R V and heading South, thought it might be a little faster than this Row By Row! 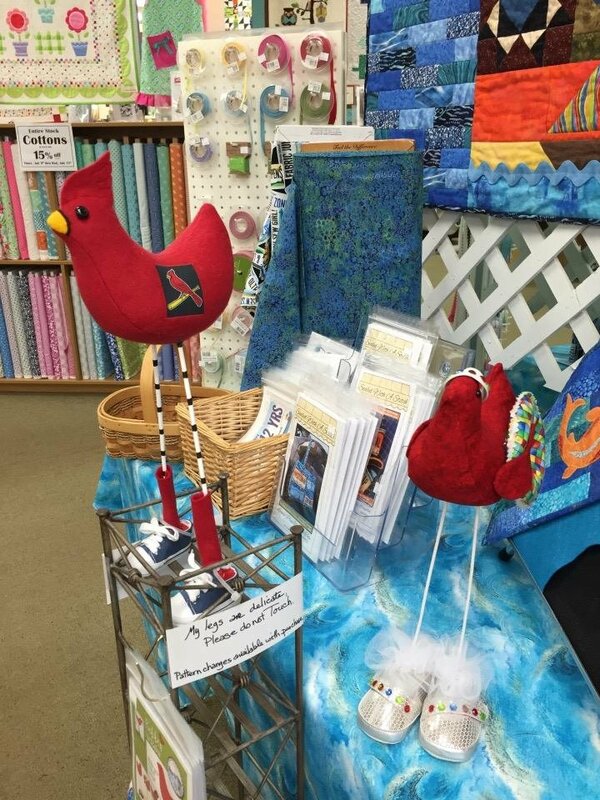 Gerties last Row By Row shop was Fields Fabrics in Kalamazoo , MI. She never thought about going to Kalamazoo, she never knows what these girls will come up with next?! 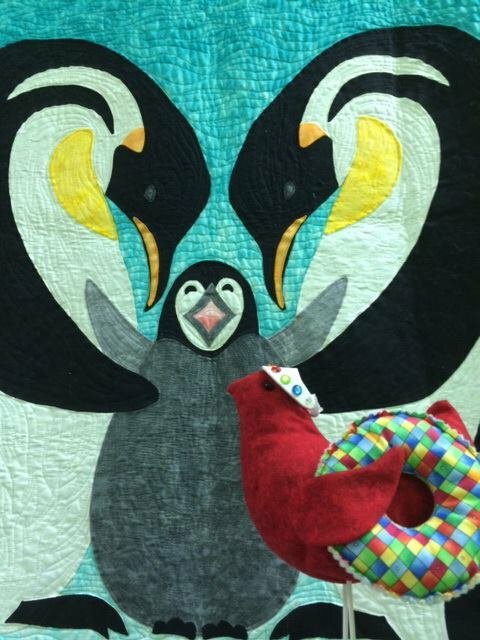 Gertie has finally landed in KY. She is at Sew Much More Quilt Store, and she's looking for her next ride. But until then, Dixie Franklin and Bella are happy to have her. 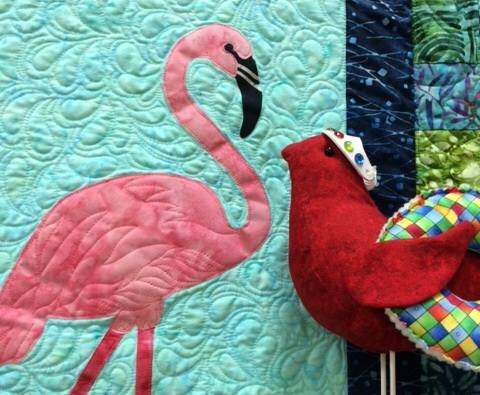 Gertie will wait there for another Row By Row quilter to take her South. Well, I never! Those sister cousins of mine planned a summer adventure and didn't invite me! I'm Nettie, the Oldest and Wisest of the Bobbins. I want to head North to see the Mackinac Bridge. I've even brought along my passport in case my travels take me to Canada! 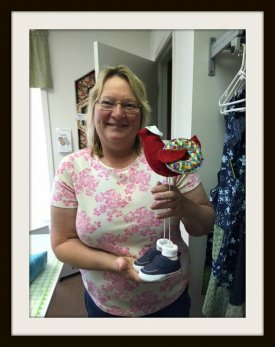 Nettie found her ride today! 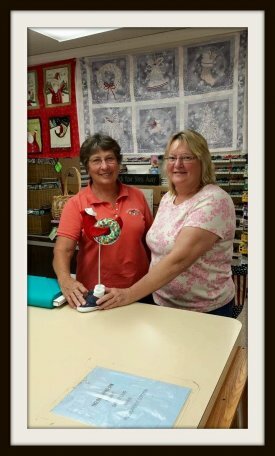 She's leaving with Kathy on her way south before heading back home to Michigan! 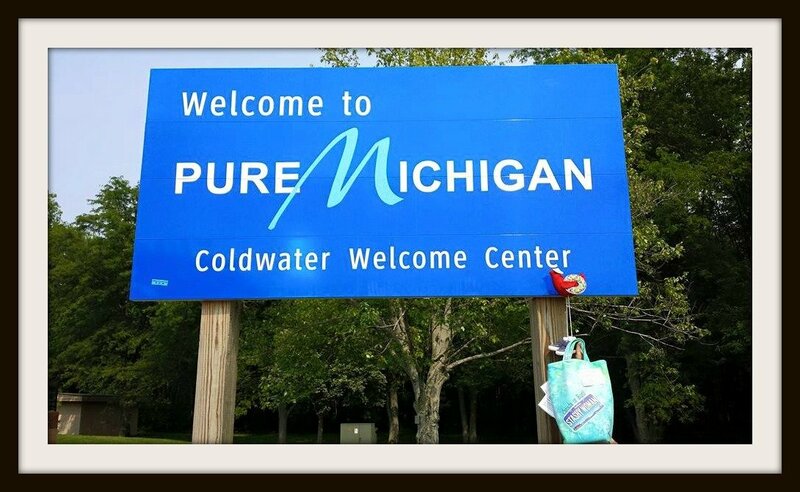 ...Mackinaw City or bust by way of Texas! Hey Girls...Nettie here. These people are confused. Canada is north. And we just arrived in Texas. Not the best at reading maps. Going to have to pull them aside, with a few margaritas and discuss directions. Ps. I took the picture! 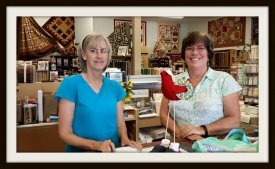 B & B Quilting in Buda, Texas. Busy day today! 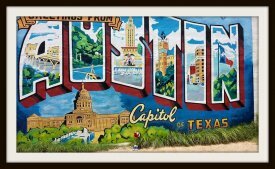 Hi from Austin. 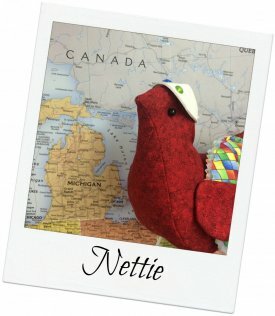 ....Nettie here! Well girls. Nettie here. 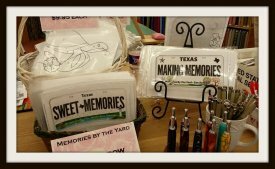 Visited Memories by the Yard today in San Antonio, Texas. Making so many new friends. And seeing the coolest row by rows and license plates. Now off to get a cinnamon roll from Lucy's bakery. Yummm! Hey girls..Nettie here. Finally got my peeps back on track. Next stop Michigan! Nothin' like a few photo ops at the state line signs! Today was a day of travel...and boy, do my wings feel it! 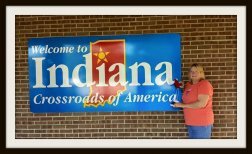 I crossed 2 state borders in one day! 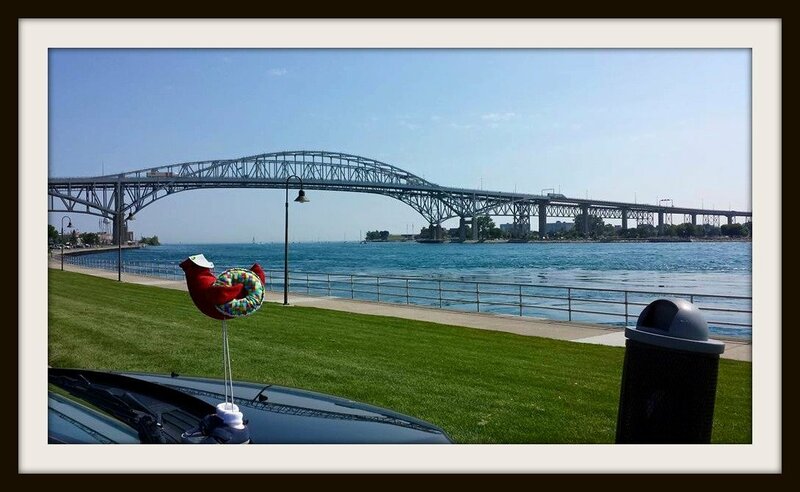 Hey girls...Nettie here...Blue Water Bridge to Canada. Heading to Marine City this morning to hitch a ride to Canada. Sew close I may able to fly..or catch a sailboat..or someone give me a good throw.....NOT.....my wings are being held down by glue...I've waved in a sailboat, they just wave back...and could end up as fish bait if I didn't get thrown far enough. Soooo playing it safe. Heading to Marine City to be picked up for ride across. Hopefully talk to you soon from Canada.